Hong Kong fencing sensation Vivian Kong Man-wai is within touching distance of becoming the world No 1 after she triumphed in the Barcelona leg of the fencing World Cup on Saturday. Kong's win marks her second World Cup victory after she defeated France's Auriane Mallo in Havana last month. Kong was in red-hot form in Barcelona as she beat Sofia Cisneros of Spain 15-7 in the last 64 and Ukraine's Kseniya Pantelyeyeva 15-10 in the last 32. She then cruised past Rossella Fiamingo of Italy 15-6 in the last 16. However, Kong was given a run for her money by tenacious South Korean fencer Sera Song in the quarter-finals. Song, who is ranked 106th in the world, pushed Kong to her limit during the nail-biting clash. Despite them being tied at 9-9 at one point, Kong managed to come out on top with a 15-13 win. Kong was again embroiled in a hard-fought battle in the semi-finals as she trailed 7-9 against Estonia's Kristina Kuusk. However, she managed to mount a come-from-behind win and triumph 15-11 to advance to the final. Facing South Korea's Lee Hyein, who is ranked 20th, in the final on Saturday, Kong had her work cut out as in their three previous meetings Lee had emerged victorious twice. But Kong continued her excellent run of form and built a 13-8 lead. Even though Lee fought back, Kong managed to hold on and claim a 15-12 win. 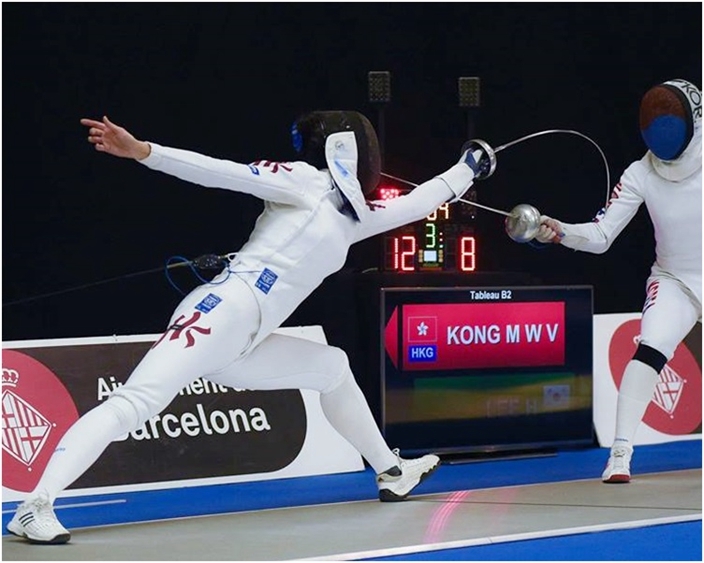 Kong's campaign in Barcelona leaves her just one point away from overtaking Italian fencer Mara Navarria as the world No 1. Should she accomplish the feat, Kong would become the first Hong Kong fencer to head the world rankings. Navarria was eliminated in the last 16, which only earned her eight points, and she now has 184 points in the standings. Kong gained 32 points with her victory in Barcelona and she sits on 183 points. Both Kang Young Mi of South Korea and Romania's Ana Maria Popescu were eliminated in the last 64, earning them two points each. Kang occupies third place in the rankings with 140 points to her name and thus poses no major threat to Kong. Popescu is fourth. Another three Hong Kong fencers - Chan Wai-ling, Coco Lin Yik-hei and Moonie Chu Ka-mong - were eliminated in the last 256, while Debbie Ho Tik-lam lost in the last 128.